With Gwazi closing forever, there’s a new question with its fate. What will happen to Gwazi? The BGT Buzz uncovered that it will not be destroyed yet, so here are a few possibilities, some of which I want to occur! Before you read them, let me remind you that these are purely my ideas and no announcement has been made. The first idea that I have is to create a Rocky Mountain Construction hybrid roller coaster. RMC has been creating some insane hybrid roller coasters with their topper track, and they are currently creating Twisted Colossus for Six Flags Magic Mountain, a dueling Iron Horse topper track roller coaster. I’ve been saying for years that this coaster would make an insane RMC (check our twitter), and I would support it becoming a smooth, inverting hybrid coaster completely. The turns and the dueling sections would make this an ideal RMC roller coaster. Here’s a video of Twisted Colossus to show what this possibility would be like. *Edit-The BGT Buzz confirmed an RMC makeover wouldn’t happen! I found out this the morning after posting! Sorry everyone! My second idea is a large roller coaster, most likely a B&M, the company that’s practically partners with Busch Gardens. Busch Gardens Tampa could use a few types of coasters, including a hypercoaster, a floorless coaster, or a wing-rider. Of these, the most likely in my opinion is a hypercoaster, the other two are very similar to the Sheikra, one of Busch Gardens Tampa’s headline attractions. The hypercoaster would bring Busch Gardens Tampa a popular, fast, non-inverting roller coaster that could easily be one of the top rated roller coasters. They could also make it a gigacoaster, which would be very similar. The floorless roller coaster would be very similar to other coasters such as Sheikra and Kumba. Shiekra is already floorless and Kumba is a sit-down looper. It would simply be a hybrid of the two coasters. Also, the wing-rider would be similar to Sheikra as it also is floorless. Any of these choices would bring a great coaster to Busch Gardens, but I think a hypercoaster would be best for the park. 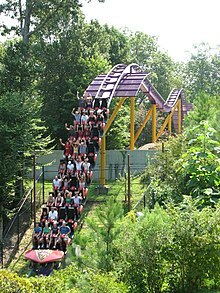 Below is a picture of Apollo’s Chariot, the hypercoaster at Busch Gardens Williamsburg. The next possibility is an entirely new land to be added to Busch Gardens. Gwazi has a very large footprint in the park and could fit an entirely new land with several rides, or even multiple roller coasters into its space. The Google Earth Image shows how large Gwazi’s footprint is. They could easily add a whole new land into this area or expand the lands surrounding it. Gwazi’s land could be occupied by multiple roller coasters and several flat rides at once. Gwazi’s demise could give Busch Gardens Tampa a grand-scale expansion. Busch Gardens Tampa announced the Cobra's Curse opening date and gave us a look at the ride's queue! Busch Gardens Tampa Recently Completed their new Mack Rides Spinning Coaster!